Head Over Heels For Teaching: Favorite Childhood Teacher Scavenger Hunt and Giveaway! Favorite Childhood Teacher Scavenger Hunt and Giveaway! After having my own giveaway, I know how appreciative I am of my friends who helped me celebrate my milestone! So...I'm excited to share in Erin and Susan's celebration! The theme for this giveaway is Favorite Childhood Teacher! This was so easy for me, even though I had so many wonderful teachers throughout my schooling! HANDS DOWN, Mrs. Barnette (yes, I still call her that! ), WAS and STILL is my favorite teacher! She was my 5th grade teacher and made learning so fun and memorable. She marked my heart at a young age, inspiring me to be a teacher. While in college, we reunited, and she helped with some of my classes. I was then placed at her school for my internship where we became very close again. I was offered a job, so then we were at the same school. Yay! At that time she taught ESE Resource and she pushed in to my class (I volunteered to take extra students so we could implement this model...see, we did push in before there was push in!!!) She was my mentor teacher and my go-to person my first year teaching...always there for me! Did I mention she also mentored me for my National Board Certification too?? Oh yea, like I said, she has ALWAYS been there for me! The best part is coming...last year she retired, but we got to teach 4th grade side by side for one year! This had always been my dream since I started teaching! I loved working so closely with her each day! (Secret: I think she liked the younger ones a little better! LOL) It's so wonderful when you teach with someone who share the same philosophy and passion as you do! I can't say enough about this woman who has had such a great impact on my life and my family's life. She's truly one of a kind and holds a special place in my heart! I love you Mrs. Barnette and I hope every child gets a Mrs. Barnette in their life! Yes, this is the Favorite Teacher Scavenger Hunt Giveaway where EVERYONE'S A WINNER! 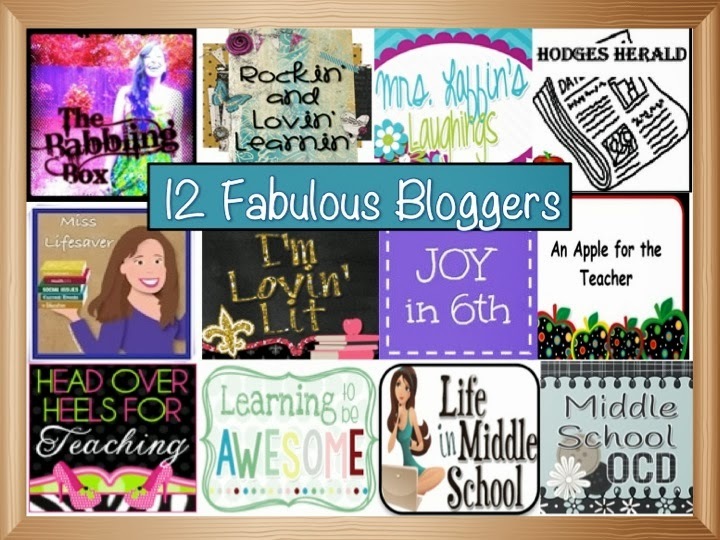 The prize pack includes more than 12 fabulous products from all the amazing teachers you see below! I've donated my Promote Great Thinking Light Bulb Cards to the Scavenger Hunt! My favorite teacher: Mrs. Barnette! I've also donated my Scan to Win Reward Tickets to the grand prize giveaway-great way to incorporate technology and motivate your students! Stop by Erin from Miss Lifesaver and Susan from Middle School OCD's blogs to enter this awesome giveaway! Wow! How incredible that you got to work with her! And that your boys got to be in her classroom too! I am so jealous, she sounds awesome. Thank you for joining in for the celebration! When I was subbing, I was able to go back at work at the schools I attended. It was weird, in a good way, to transition into a peer with many of my former teachers. I love the relationship the two of you developed and that she continues in her role as your teacher while becoming a dear friend! Thanks so much for being a part of this, Joanne! How amazing that someone that inspired you to be a teacher, can be honored by the fantastic teacher you have become! WOW! How wonderful that Mrs. Barnette has been a part of your life for so long. This just makes my heart happy! You're right...it must be the "ette" names that make fabulous teachers! You inspire me all the time! Love you!